Thank you for the world that I play in everyday. Thanks, it's a quickie, I want to go back and flesh it out more. I yes that is so true. Nice Kekai... What? He left us? Didn't know that. May God give him the peace he deserves... he has inspired a million artist. Really sad news, RIP Frank Frazetta. Very sad, indeed. Nice homage. 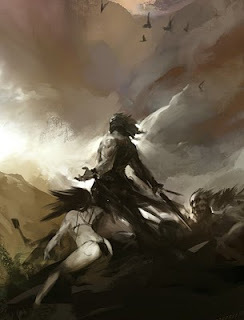 Nice Frazetta piece. You honor him. Very nice piece, he was a true legend. RIP Mr Frazetta. End of a great era. It took a while for it to sink in for me. Life is too short...But hey, he was one hell of a visionary. And as much of an icon as Conan himself. That's a powerful picture there too Kekai. There are people on this planet that do work following in his footsteps. Like Bizley you are one of those...Cool fantasy art with balls. HAIL FRANK FRAZETTA! Perfect image for a tribute to an amazing artist.He will be missed. Cheers. very good tribute to an extraordinary man...Your work is amazing! Gorgeous.. RIP to the legend.. Sad news indeed. A true master and inspiration to many. Nice piece Kekai, captures the Frazetta spirit for sure. Well done.